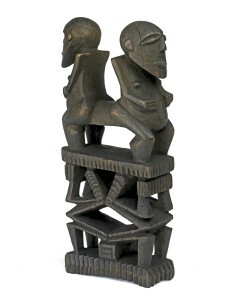 Double figure, ti’i. Late 18th century. Wood, 24 x 22 13/16 in. Society Islands, Tahiti. The British Museum, London. Gauguin and Polynesia: An Elusive Paradise at the Seattle Art Museum tells not one powerful story, but two. Rarely, if ever, has a major exhibition on post-impressionist Paul Gauguin (1848-1903) dedicated such attention to the arts of Polynesia, which Gauguin discovered at the 1889 World’s Fair in Paris. Their primal, symbolic forms inspired him to spend the latter years of his life on extended trips to Tahiti, New Zealand and finally the isolated Marquesas, in pursuit of a primitive paradise and of a visual lexicon to express the universal and spiritual. Gauguin’s oeuvre is art born of a profound cultural encounter. Gauguin and Polynesia allows you to make that same journey of discovery; the show places almost 60 pieces of Gauguin’s vibrant paintings, sculptures, sketches and prints alongside as many remarkable Polynesian traditional carvings and ceremonial objects. 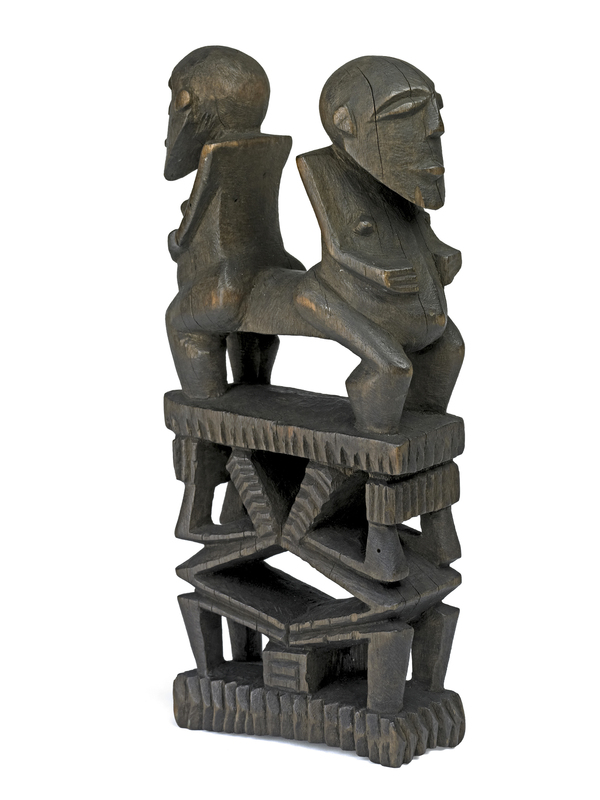 On display are intricately carved Polynesian tiki figures, u’u (war clubs) and rapa (dance paddles) from the late 18th and early 19th centuries—the era of European exploration in the Pacific, the age of Captain Cook and Bougainville—such as Gauguin might have seen at the World’s Fair. You can also view examples of artifacts that Gauguin incorporated into his work, from a pu taina (ear ornament) whose geometrical motifs appear in a fence in Gauguin’s The Sacred Mountain, to a kohau rongorongo, a tablet bearing the Rapa Nui (Easter Island) script that appears in the background of his portrait, Tehemana Has Many Parents. The exhibition also reveals the tragic disintegration of Polynesian cultures following contact with the Europeans. 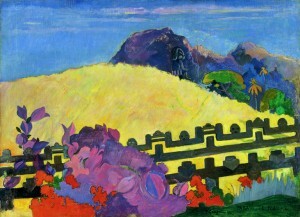 By the time Gauguin voyaged to Tahiti in 1891, the populations of the Polynesian islands had been decimated by disease and warfare; much of the older artwork had already been carried off to collectors in Europe; and traditional crafts were prohibited by the Catholic Church. The show’s curator, Suzanne Greug of Art Centre Basel, has collaborated with SAM and with Copenhagen’s Ny Carlsberg Glypotek to cultivate a fresh appreciation for the beauty and skill of traditional Polynesian arts, just as Gauguin might have experienced. Catch Gauguin and Polynesia: An Elusive Paradise at SAM downtown, now through Apr. 29. And while you’re there, venture over to the new Level 3 Oceanic Art Gallery, where Pam McClusky, SAM’s Curator of Art of Africa & Oceania, has placed Polynesian artworks from the museum’s permanent collection into environments created by Seattle artist Allyce Wood, displaying them in traditional contexts. For an even bigger Polynesian cultural experience, join SAM on Saturday, Mar. 10, for the Gauguin & Polynesia Community Day, with tours, live music and Tahitian dancing. For more information, see http://www.seattleartmuseum.org. Parahi te Marae (The Sacred Mountain), 1892. Oil on canvas, 26 x 35 in. Philadelphia Museum of Art: Gift of Mr. and Mrs. Rodolphe Meyer de Schauensee, 1980.